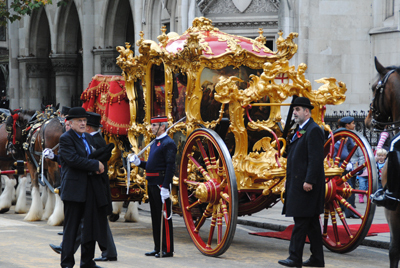 • The Lord Mayor’s Show will mark its 800th anniversary on Saturday as the newly elected Jeffrey Mountevans – the 688th Lord Mayor of the City of London – makes his way through the City to Westminster to swear loyalty to the Crown. The procession of 7,000 people, some 180 horses and 140 vehicles will set off on its way along a three-and-a-half mile route at 11am, starting at Mansion House and traveling down Cheapside to pause at St Paul’s Cathedral (which is open for free all day) before heading on via Ludgate Hill and Fleet Street to the Royal Courts of Justice before returning the City via Queen Victoria Street from 1.10pm. In a special nod to the 800th anniversary, the famous bells of St Mary-le-Bow will ring out a special 800-change at noon. The day will conclude with fireworks over the River Thames kicking off at 5.15pm (for the best view head down to the riverside between Waterloo and Blackfriars Bridges, either on Victoria Embankment or on the South Bank). 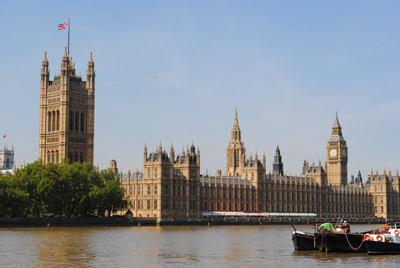 The show’s origins go back to 1215 when, in exchange for a Royal Charter granting the City of London the right to elect its own mayor, King John insisted the newly elected mayor travelled to Westminster each year to swear loyalty to the Crown. 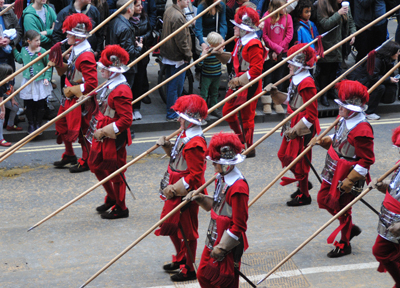 For more (including a map to print out), see https://lordmayorsshow.london. PICTURE: From a previous show. • Vermeer’s The Music Lesson is among 27 of the finest 17th and 18th century Dutch paintings in the Royal Collection which will go on display in a new exhibition at the Queen’s Gallery at Buckingham Palace from tomorrow. Masters of the Everyday: Dutch Artists in the Age of Vermeer also features works by the likes of Gerrit Dou, Pieter de Hooch and Jan Steen, all produced during what is known as the Dutch ‘Golden Age’. The exhibition is being shown alongside another display – High Spirits: The Comic Art of Thomas Rowlandson – which will focus on the work of 18th and early 19th century caricaturist Thomas Rowlandson. Around 100 of Rowlandson’s works feature in the display with highlights including The Two Kings of Terror featuring Napoleon and Death sitting face-to-face after Napoleon’s defeat at Leipzig in 1813, The Devonshire, or Most Approved Method of Securing Votes depicting Georgiana, Duchess of Devonshire, kissing a butcher (it was claimed she had claimed kisses for votes in the Westminster election of 1784), and A York Address to the Whale. Caught lately off Gravesend in which the Duke of York thanks a whale for distracting attention from accusations that his mistress was paid by army officers to secure promotions from the Duke. Admission charge applies. Both exhibitions run until 14th February, 2015. For more, see www.royalcollection.org.uk. • The first major UK exhibition of the works of kinetic sculpture pioneer Alexander Calder opened at the Tate Modern this week. Alexander Calder: Performing Sculpture features more than 100 of the ground-breaking 20th century artist’s works which trace how Calder turned sculpture from the idea of a static object to a continually changing work to be experienced in real time. Works on show include figurative wire portraits of artists – Joan Miró and Fernand Léger (both 1930), works exploring the idea of forms in space – Red Panel, White Panel and Snake and the Cross (1936), motorised mobiles such as Black Frame and A Universe (1934), and chiming mobiles such as Red Gongs (1950) and Streetcar (1951). It closes with the large scale Black Widow (c.1948), shown for the first time ever outside Brazil. Runs until 3rd April. Admission charge applies. For more, see www.tate.org.uk. • Get an up close and in-depth look at the Bronze Age as virtual reality comes to the British Museum this weekend. For the first time, families including children aged 13 or over will be able to wear Samsung Gear VR devices to virtually explore a Bronze Age site designed by Soluis Heritage which features objects from the museum’s collections. They will also be able to enter an “immersive fulldome” where they can explore a virtual reality world featuring a Bronze Age roundhouse and objects. The event will take place in the Samsung Digital Discovery Centre on Saturday and Sunday. For more, see www.britishmuseum.org. 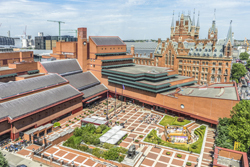 • The British Library at St Pancras has been given Grade I heritage status, joining the top 2.5 per cent of listed buildings in England. Designed by architect Sir Colin St John Wilson and his partner MJ Long and completed in the late Nineties, the library is the largest public building to have been built in the UK in the 20th century. At the heart of the library is the King’s Library tower which houses the library of George III as well as the Treasures Gallery where national treasures such as the Magna Carta, Lindisfarne Gospels and original Beatles lyrics are displayed. The library was listed along with seven other libraries in England, all of which have been given Grade II status. Meanwhile the record-breaking exhibition Magna Carta: Law, Liberty, Legacy has entered its final month before closing on 1st September. The display features two of the four surviving Magna Cartas as well as the US Declaration of Independence and Bill of Rights – in the UK for the first time – and more than 200 objects including medieval manuscripts, artworks, 800-year-old garments and esoterica such as King John’s teeth and thumb bone. Admission charge applies. For more, see www.bl.uk/magna-carta. PICTURE: Tony Antoniou/British Library. • Help build The People’s Tower in Douglas Square in Deptford, south east London, this weekend. French artist Olivier Grossetete has been invited by the Albany to build the tower – with your help – out of cardboard boxes. Tower assembly takes place between 10am and 3pm on Saturday and then between 11am and 5pm on Sunday, there will be free live music and family entertainment in the Albany Garden as the tower is finished and then knocked down. No booking is required. For more, check out www.thealbany.org.uk. The current London Bridge, which spans the River Thames linking Southwark to the City, is just the latest in several incarnations of a bridge which originally dates back to Roman times. This week, we’re focusing on first stone bridge to be built on the site. Constructed over a period of some 33 years, it was only completed in 1209 during the reign of King John, some six years before the signing of the Magna Carta. Construction on the bridge began in 1176, only 13 years after the construction of an earlier wooden bridge on the site (the latest of numerous wooden bridges built on the site, it had apparently built of elm under the direction of Peter de Colechurch, chaplain of St Mary Colechurch, a now long-gone church in Cheapside). It was the priest-architect de Colechurch who was also responsible for building the new bridge of stone, apparently on the orders of King Henry II. While many of the wealthy, including Richard of Dover, the Archbishop of Canterbury, gave funds for the construction of the bridge, a tax was also levied on wool, undressed sheepskins and leather to provide the necessary monies – the latter led to the phrase that London Bridge was “built upon woolpacks”. King John, meanwhile, had decreed in 1201 that the rents from several homes on the bridge would be used to repair it into perpetuity. The bridge, which featured 20 arches – a new one built every 18 months or so, was apparently constructed on wooden piles driven into the river bed at low water with the piers of Kentish ragstone set on top. It was dangerous work and it’s been estimated that as many as 200 men may have died during its construction. The bridge was almost completely lined with buildings on both sides of the narrow central street. These included a chapel dedicated to St Thomas á Becket – a stopping point for pilgrims heading to the saint’s shrine in Canterbury, as well as shops and residences (although, apart from the chapel, we know little about the original buildings). There was also a drawbridge toward the southern end and the Great Stone Gate guarding the entrance from Southwark. Peter de Colechurch died in 1205, before the bridge was completed. He was buried in the undercroft of the chapel on the bridge. Three men subsequently took on the task of completing the bridge – William de Almaine, Benedict Botewrite and Serle le Mercer who would go on to be a three time Lord Mayor of London. All three were later bridge wardens, the City officials charged with the daily running of the bridge itself. One of key events on the bridge in the years immediately after its completion was the arrival of Louis, the Dauphin of France, in May, 1216. 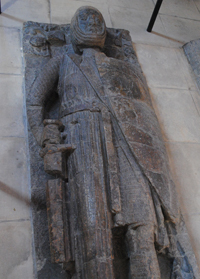 Louis had been invited to depose John by the rebellious barons after the agreement sealed at Runnymede fell apart and in 1216, he and his men marched over London Bridge on their way to St Paul’s Cathedral. (We’ll deal with this in more detail in a later post). What became known as ‘Old London Bridge’, which stood in line with Fish Street Hill, survived the Great Fire of 1666, albeit badly damaged, but was eventually replaced with a new bridge, known, unsurprisingly as ‘New London Bridge’, which opened in 1831. Designed by John Rennie, this bridge was later replaced by one which opened in 1971 (Rennie’s bridge was sold off and now stands in Lake Havasu City, Arizona). For a detailed history of Old London Bridge, check out Old London Bridge: The Story of the Longest Inhabited Bridge in Europe . We interrupt our regular programming today to mark a truly historic milestone – 800 years since King John set his seal to the Magna Carta (Great Charter) in a field at Runnymede to the west of London. So, where can you see a copy in London? The British Library actually holds two of the four surviving documents from 1215 (one is pictured above) – the other two are held by Lincoln and Salisbury Cathedrals. One of the copies in the British Library was damaged in an 18th century fire; the other was found in a tailor’s shop in London in the 17th century – made of sheepskin, it was apparently about to be taken apart to line collars. The library’s current Magna Carta exhibition, Magna Carta: Law, Liberty, Legacy, features the two documents (along with Jefferson’s handwritten copy of the Declaration of Independence and one of the original copies of the US Bill of Rights). For more about the exhibition, see www.bl.uk/events/magna-carta–law-liberty-legacy (runs until 1st September – for more see our earlier post here). Meanwhile, the City of London Corporation also possesses a copy of the Magna Carta – although a later one that that issued in 1215. 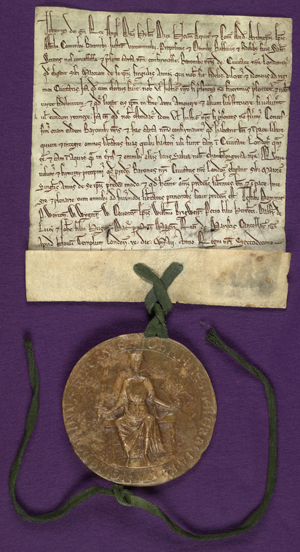 Issued by King Edward I in 1297, this was the one which saw the document’s clauses, somewhat changed from 1215, written into the statutes for the first time. Stored at the Guildhall Art Gallery, it is too delicate to be on permanent display but is currently on display in the City of London Heritage Gallery until 1st October (for more follow this link). 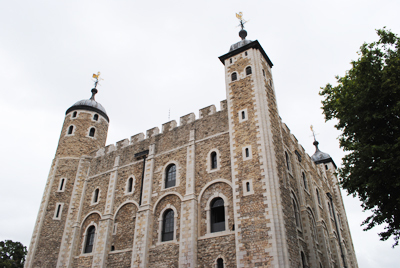 You can read more about the Magna Carta and its London connections in our Wednesday series, 10 sites from London at the time of the Magna Carta. 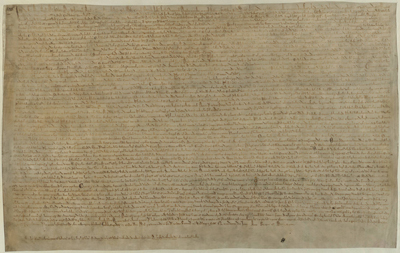 • The largest ever exhibition related to the Magna Carta opens at the British Library in King’s Cross tomorrow to mark the 800th anniversary of the document’s sealing. Magna Carta: Law, Liberty, Legacy features two original Magna Carta manuscripts from 1215 as well as 1215 document, the Articles of the Barons (known as ‘draft’ of the Magna Carta), the Petition of Right (1628), the English Bill of Rights (1689), and the Universal Declaration of Human Rights (1948). It will also display two of the most celebrated documents in American history – the Delaware copy of the Bill of Rights and Thomas Jefferson’s handwritten copy of the Declaration of Independence (both on loan from the US National Archives) – along with UK cabinet papers from 1941 in which it was proposed an original Magna Carta manuscript from 1215 be given to the US in return for their support in World War II and artefacts including King John’s teeth, thumb bone and fragments of clothing taken from his tomb in 1797 as well as his will. The exhibition tells the story of the Magna Carta from its creation in 1215 through to its later use by people fighting for various rights and freedoms and its continuing impact on the world today. There’s also a series of interviews with politicians, historians and public figures including Burmese activist Aung San Suu Kyi, former US President Bill Clinton and William Hague. Runs until 1st September. Admission charge applies. For more – and a digitised gallery of artifacts – visit www.bl.uk/magna-carta-exhibition. 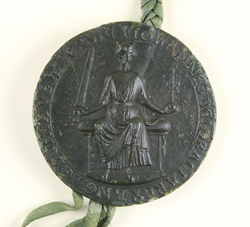 PICTURE: Great Seal of King John, 1203 © Eton College Archives on display in Magna Carta: Law, Liberty, Legacy. • The first gallery exhibition devoted to the Duke of Wellington opens at the National Portrait Gallery off Trafalgar Square today. Marking the 200th anniversary year of the Battle of Waterloo, Wellington: Triumphs, Politics, and Passions explores Wellington’s political and military career as well as his personal life. Highlights include Goya’s 1812 portrait of Wellington following his entry into Madrid (later modified to recognise further battle honours and awards), and Thomas Lawrence’s famous portrait painted in 1815, the same year as the Battle of Waterloo (the painting, which normally hangs in Apsley House, was used as the basis of the design of the £5 British note from 1971 to 1991). The exhibition of 59 portraits and other works also includes rarely seen works loaned by Wellington’s family include a John Hoppner portrait of the duke as a young soldier and a daguerreotype portrait taken by Antoine Claudet for Wellington’s 75th birthday in 1844. Runs until 7th June. Admission is free. For more, see www.npg.org.uk or for more on the 200th anniversary of the Battle of Waterloo, see www.waterloo200.org. • An exhibition celebrating the works of the late fashion designer Alexander McQueen opens at the V&A in South Kensington on Saturday. Alexander McQueen: Savage Beauty presents his works in 10 sections which focus on everything from McQueen’s roots in London, his “skilful subversion of traditional tailoring practices”, his fascination with the animal world and his longstanding interest in Eastern cultures. At the centre of the exhibition is The Cabinet of Curiosities, a display showcasing more than 100 garments and accessories and shown with film footage from his many catwalk presentations. The exhibition runs until 2nd August. Admission charge applies but you’ll have to be quick – the exhibition has already set the record for the most ever advance sales for an exhibition at the museum. For more, see www.vam.ac.uk/savagebeauty. Baynard’s Castle actually refers to two buildings – a Norman fortification demolished in the early 13th century and a later medieval palace located to the east of the original structure. This week we’re looking at the first of those buildings – the Norman fortification. The first Baynard’s Castle was built in the late 11th century by Ralph Baynard (Baignard) and is believed to have replaced an earlier fortification at the site at the junction of the Thames and the Fleet rivers (the river now emerges into the Thames under Blackfriars Bridge). Baynard (his name may be the origin of the name for Bayswater – Baynard’s Watering place – see our earlier post here), was the sheriff of Essex and a supporter of William the Conqueror. The castle – which is said to have featured walls and parapets and which is generally said to have been on the waterfront (although some have said it was located inland) – remained in Baynard’s family until the reign of King Henry I when in 1111, his grandson William Baynard apparently forfeited his lands for supporting Henry’s eldest brother and would-be king, Robert Curthose. 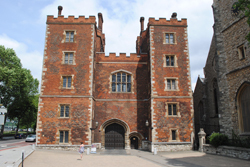 It was later passed to the King’s steward Robert Fitz Richard, son of the Earl of Clare, and is known to have been inherited by his grandson, Robert Fitzwalter. Fitzwalter, however, was a key opponent of King John and as early as 1212 he was in hot water for his part in a conspiracy against the king, although he stated it was because the king tried to seduce his daughter, Matilda the Fair. Either way, he escaped trial by heading to France and John seized the opportunity to raze the castle which he did on 14th January, 1213. Fitzwalter was later forgiven under an amnesty and went on to play a leading role among the baronial opposition to Kong John – he was among 25 barons charged with enforcing the promises of the Magna Carta of 1215. 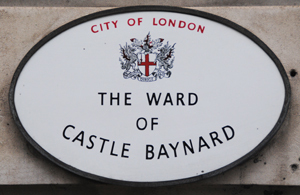 The name Baynard’s Castle is remembered in the London ward of Castle Baynard (pictured) which covers the area in which it once stood. As we all know by now, Prince William and Kate, Duchess of Cambridge, are proud parents of a new born son with news of the new arrival provoking celebrations across Britain and, indeed, the world. • The last time a Home Secretary attended a royal birth was in 1936 for the birth of Princess Alexandria, cousin of the Queen. The practice was officially stopped before the birth of Prince Charles in 1948. • Such was the doubt over whether Mary of Modena, wife of King James II, was really pregnant that more than 40 eminent people were invited to witness the birth of their son Prince James in 1688 (and even then the rumours of that the stillborn baby had been swapped for another were rife). • Queen Anne, who ruled from 1702-1714, went through 17 pregnancies but, tragically, outlived all of her children, her last surviving child – the Duke of Gloucester – dying in 1700. • The tradition of firing a 41 gun salute on the news of the birth of a future monarch dates from the birth of the future King Edward VII. Twenty-one shots are fired in honour of the birth with an additional 21 fired because the guns are located in Green Park, a Royal Park. • Queen Elizabeth II was born by caesarean section at 2.40am on April 21, 1926, at the home of her mother’s parents – 17 Bruton Street in Mayfair. (See our previous post on this here). • Queen Victoria, who had nine children, used chloroform for pain relief during later births, despite the concept being frowned upon by some officials. • Buckingham Palace (pictured above) has been the birthplace of numerous Royal Family members. Of course, Prince Charles was born here in 1948 as was his brother Prince Andrew (1960) and Prince Edward (1964) but so too – somewhat earlier – were 14 of King George III and Queen Charlotte’s 15 children when the property was known as Buckingham House and, later, the Queen’s House. King Edward VII was the only monarch who both was born and died in the building. • Such was the desperation of King Henry VIII for a son, that a document announcing the birth were drawn up to that effect prior to Anne Boleyn giving birth to a daughter, the future Queen Elizabeth I. The document was still issued – the only concession being an ‘s’ added to the end of the word prince. • The oldest English king to father a child was King Edward I – he was 66-years-old when his last child, Princess Eleanor, was born in 1306. Queen Eleanor of Aquitaine, wife of King Henry II, was the oldest queen to father a child when she gave birth to the future King John at 44-years-of-age in 1166. A relatively short-lived Norman fortification located on Ludgate Hill, this tower or ‘castle’ was probably built in the late 11th century and was one of several new fortress located in the city post 1066. Believed to have been built by Gilbert de Monfichet – a relative of King William the Conqueror who hailed from Rouen (and is believed to have been connected with Monfichet family of Stansted Monfichet in Essex), the tower apparently comprised a stone keep on a motte surrounded by ditches. It was located on Ludgate Hill near the city wall, to the north of Carter Lane, on what was then the western edge of the walled city. 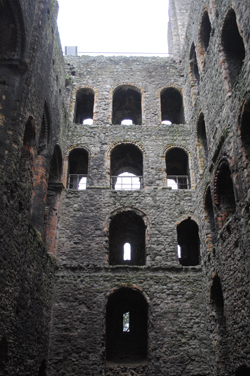 First appearing in documents in the 1130s, it was apparently strengthened during a revolt against King Henry II in 1173-1174 but was eventually demolished in the 13th century (some accounts suggest it was King John who ordered its demolition in 1213, after Gilbert’s successor Richard was banished). 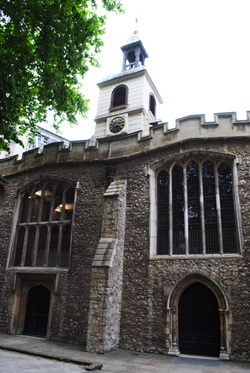 The site was given to the Dominican priory of Blackfriars in 1275 (there’s a suggestion that the tower was already in ruins by 1278 meaning it must have been at least partially demolished some time prior). Apparently some of the masonry from the tower was used in the priory’s construction. Excavations in the 1980s revealed the remains of a ‘V’ shaped defensive ditch – interpreted as one of three defensive ditches which protected the tower – and rubbish and cess pits – interpreted as standing within what was the tower’s bailey. 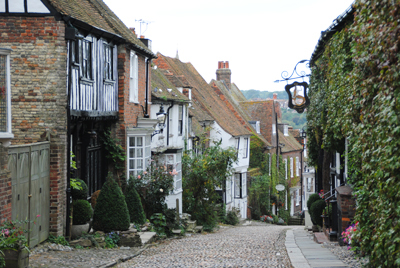 We’ve talked about the Medway town of Rochester earlier in the week as part of our Dickens series but it’s also worth talking about this town in Kent in its own right. 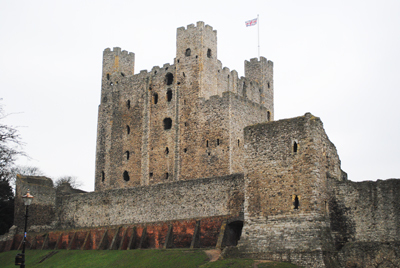 While Dickens’ connection with the town is a key part of the reason for its charm, this town, which dates from as far back as Roman times and remained an important centre thanks to its strategic position on the Medway, has plenty more to offer. 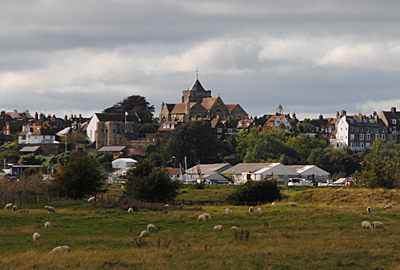 Foremost among its attractions are the Norman castle and cathedral. Rochester Castle has its origins in a wooden castle built soon after the Battle of Hastings in 1066 with the stone defences following soon after. 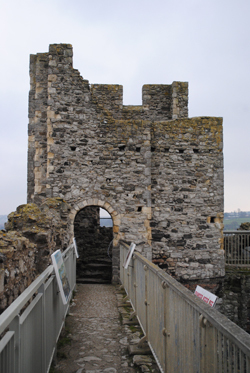 The tallest Norman keep in England, from which there are spectacular views, was built around 1127 on the order of its then owner, the Archbishop of Canterbury, William de Corbeil. It was about 90 years later, in 1215, when King John laid siege to it during the rebellion of his barons, only taking the castle after a seven week siege when his sappers undermined the south-east tower of the keep (famously it was the fat of 40 pigs which stoked the fire they laid in the tunnels under the tower). The castle was repaired and continued to be used until late medieval times when it fell into disuse and while much of the keep – the highest in England – is now ruined, it remains a stirring sight. Rochester Cathedral, meanwhile, was first built in Saxon times (there has been a bishop here since 604) although no trace remains of this above ground. 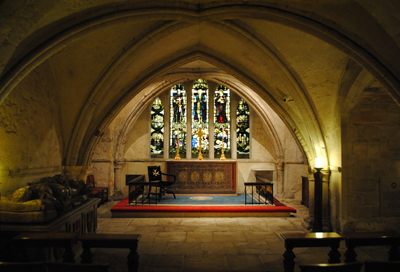 The current building, rather, dates from the Norman era – it was consecrated in 1130 in a ceremony attended by King Henry I – and was extensively added to over the following centuries with the completion of the Lady Chapel in 1492 the last major work. 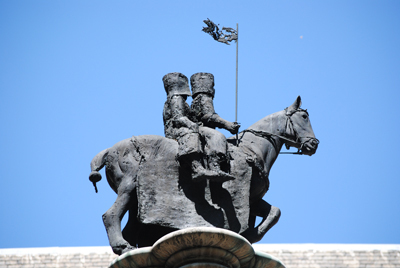 Among the most famous bishops here were Bishop Fisher and Bishop Ridley – both of whom died for their faith. Strolling through the cobbled streets of this historic town, about 30 to 40 minutes from London by train, you’ll also come across the Guildhall Museum, which is housed in the 17th century guildhall and features a range of displays and exhibitions on the history of the Medway including a Dickens discovery room. Also worth seeing is Eastgate House, the model for Dickens’ Westgate House and now the location of the Swiss chalet in which he wrote, and Restoration House – created from two medieval buildings in the 16th or 17th centuries and the inspiration for Miss Havisham’s home (see our earlier post). One unmissable gem is the Six Poor Travellers – an atmospheric and well preserved almshouse in the High Street which dates from Elizabethan times and has an amazing backstory which you can explore as you make your way through its narrow rooms. Part of the charm of Rochester (and for more on Rochester generally visit www.cometorochester.co.uk/visit/index.htm) lies in its close proximity to Chatham and Gillingham and here you’ll find much more to amuse and entertain including Chatham’s Historic Dockyards (see our earlier daytripper on this), Fort Amherst, Britain’s largest Napoleonic fortress, and for those who can’t get enough of Charles Dickens, Dickens World. 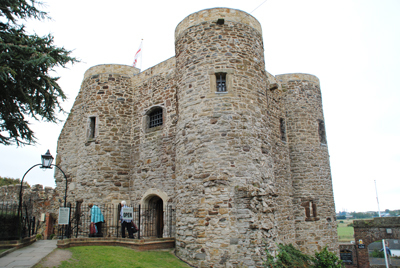 Just to the north of Rochester is Upnor Castle, a rare surviving Elizabethan artillery fortress built to defend the fleet at Chatham Dockyard.